Salvatorferwohnwohnung Modern and comfortable newly built apartment with 95sqm. Property 5: Salvatorferwohnwohnung Modern and comfortable newly built apartment with 95sqm. Quiet restful retreat in a charming community. Property 8: Quiet restful retreat in a charming community. Chalet with every comfort in the Swabian Alb. 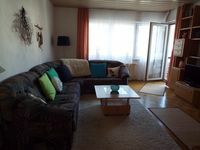 Property 44: Chalet with every comfort in the Swabian Alb. Great Apartment, great location fantastic hosts. Location very quiet, lots of walking opportunities, close to highway, larger towns, historical places. The apartment is clean, spacious and very comfortable. The hosts are fantastic. Our time and stay at Rita's apartment was very comfortable &amp; enjoyable. Hope to return again some day.